Maryjean Wall, turf writer for the Lexington Herald-Leader for more than 35 years, has documented the fascinating true story of vice and power in the Gilded Age South. At the center of her new book is Belle Brezing, a woman who borrowed money to set up her own brothel, eventually accumulating wealth, power and fame. By the time Belle was 15 years old, she’d had a baby, had watched her mother die and been evicted. During the 1880s, there were limited career paths for young women, especially those unfortunate enough to lack a formal education and social connections. While working at Jenny Hill’s bawdy house in Lexington, which incidentally was run out of the former home of first lady Mary Todd Lincoln, Belle acquired the skills, manners and business contacts that allowed her to ascend to power and influence as an internationally known madam. Belle opened her own brothel and leveraged that first house and her early connections with its wealthy patrons to purchase an impressive structure at 59 Megowan Street. The grand opening in 1891 became legendary in Kentucky. Visitors were met with the sounds of an orchestra as they sampled an elegant buffet including imported wines and champagne. It was here that fashionable international travelers, horsemen and civil leaders climbed the five steps to enter what would quickly become one of the most intriguing business destinations in the South. 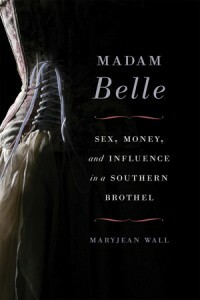 Maryjean Wall began her research of Belle Brezing and her infamous mansion in the 1960s. Since Belle Brezing did not keep a diary and never gave interviews during her lifetime, it was a difficult task, but Wall has achieved the almost impossible. This engaging biography comes as close to revealing the life of Belle as is possible.